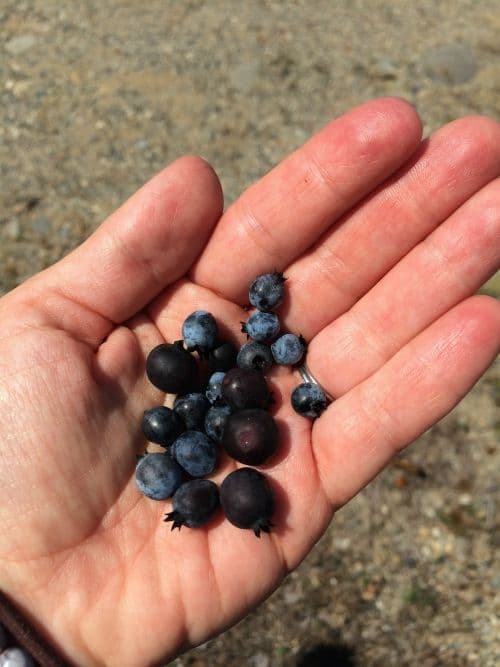 Last month, I traveled to Maine to learn about wild blueberries. 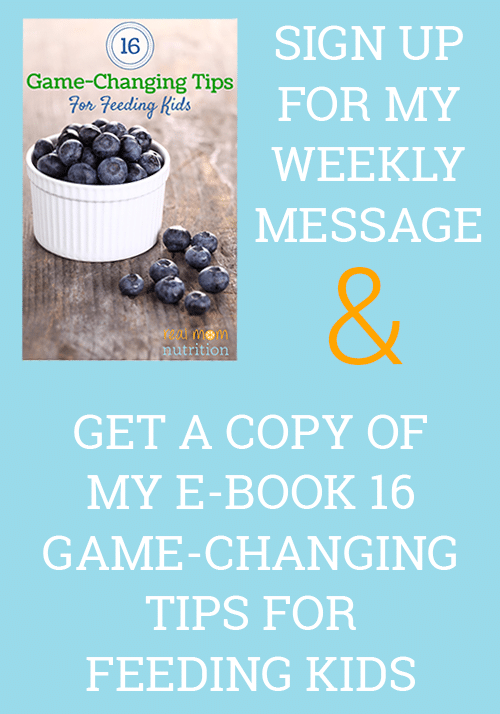 I was a guest of The Wild Blueberry Association of North America, who covered my travel expenses and accommodations, but I was not compensated for writing this post. All opinions expressed are my own. True to their name, wild blueberries grow wild–and have for thousands of years. They thrive in Maine, where they have to be strong to survive the sometimes-harsh climate. That means they’re loaded with compounds that protect them. And us. 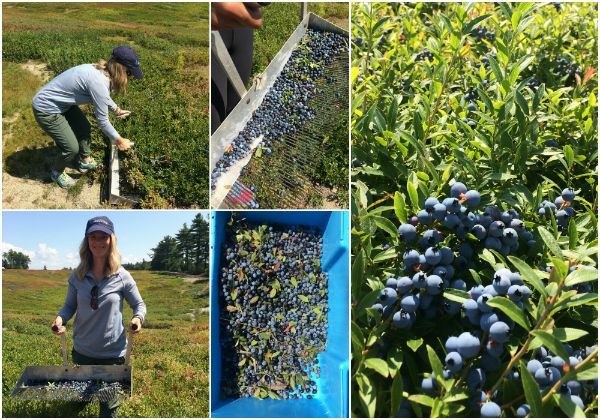 Last month, along with a group of other dietitians, I visited Maine at the peak of harvest to learn about wild blueberries. Since blueberries are my favorite fruit, it was a thrill to be standing in a field of blueberries as far as the eye could see. Wild blueberries are tiny in comparison to cultivated blueberries, the kind you buy in the produce section. They also grow very low to the ground instead of high on a bush. Since they grow completely wild and spread naturally, there are thousands of different varieties in every field–which means all sizes and shades of blue in a handful of picked berries. Wild blueberries are tiny but mighty. They have a more intense blueberry flavor than regular cultivated blueberries. And they have the highest antioxidant capacity per serving compared to more than 20 other fruits (and twice the capacity of regular blueberries). They’re being studied for all kinds of potential benefits, from cancer prevention to heart health. About forty percent of the harvest is still picked by hand, using these (heavy!) rakes, which we got to try out. It was hard work picking a small amount of berries. I’ll stick to eating them, thankyouverymuch. If you’ve never noticed wild blueberries in the store, look in the freezer section. Most of the wild blueberry crop is frozen, either bagged up for consumers or sold to manufacturers for products like baking mixes and muffins. Our grocery store stocks them right alongside other frozen fruit. 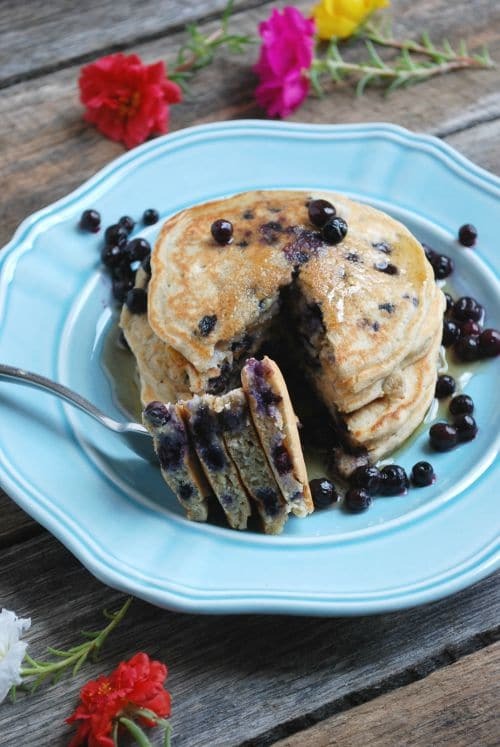 Wild blueberries are the perfect size for pancakes, because every bite is loaded with berries. These pancakes freeze well too: Just set them out to cool, freeze them in a single layer on a baking sheet until slightly firm, then transfer into a gallon ziptop bag. When you want some, zap them in the microwave to take off the chill, then warm them in the toaster oven or microwave. Beat egg until light and fluffy. Add flour and remaining ingredients (through salt) and stir just until combined. 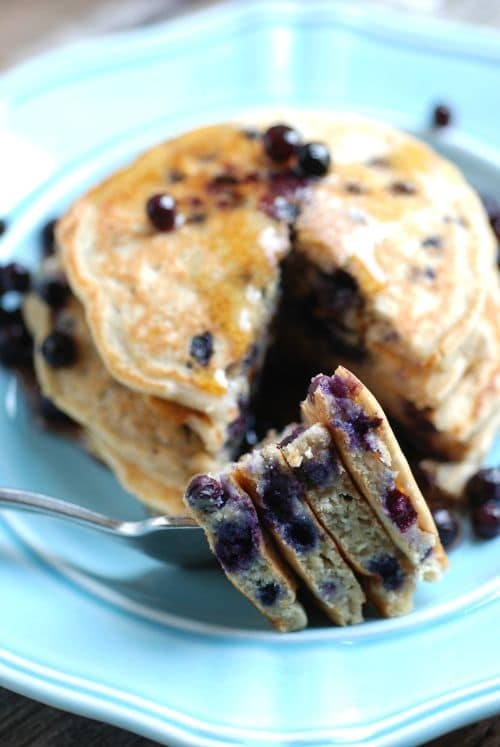 Fold frozen blueberries into batter. While batter rests, preheat skillet or griddle. Brush melted butter onto surface. When griddle or skillet sizzles, drop batter on using a quarter-cup measure. When surface bubbles and bottom is brown, flip pancakes. Repeat process of buttering griddle and pouring batter until batter is done. 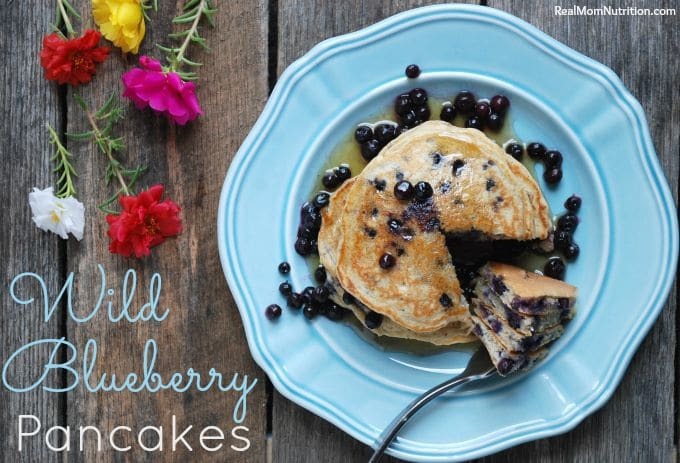 Get more ways to cook and bake with wild blueberries using this recipe index. Get ten amazing smoothie recipes featuring wild blueberries (including a blueberry-lemon green smoothie from me!). Frustrated With Your Toddler? Read This! Yumm! I always think that wild blueberries taste so much better! About how much do these blueberries cost compared to ordinary frozen fruit or local blueberries in season? I don’t get so hung up on food miles anymore but can’t help noticing when something is shipped in for breakfast from a great distance. Also, how much are the hand pickers paid and how are they treated. I am beginning to get caught up in the social justice thing and it is just horrible how so many of the field hands are treated. Do women and children work in the blueberry fields? I have tried to make blueberry pancakes with regular blueberries (and as local as my location can get) and they are not the same. The berries are too big which causes the pancakes to fall apart. We’ve tried mashing the blueberries first but then you don’t get that burst of berry so they’re disappointing too. Wild blueberries are the way to go. 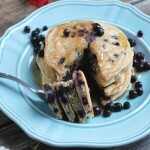 Nadine–the smaller size of wild blueberries is definitely perfect for pancakes! Hi Jessica–the wild blueberries tend to cost more than the cultivated berries. As for the other information, I will try to get some answers for you! 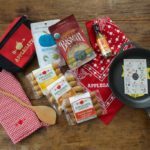 Jessica– Here’s what the Wild Blueberry Association of North America relayed to me. Hope this helps. 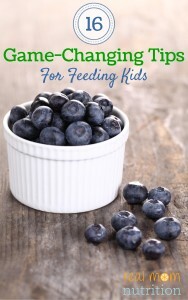 Prices vary by market and time of year but in general frozen Wild Blueberries do provide a significant cost savings over fresh regular blueberries because they come in convenient resealable freezer bags that eliminate waste while maintaining the intense taste and nutritional integrity of the little fruit. 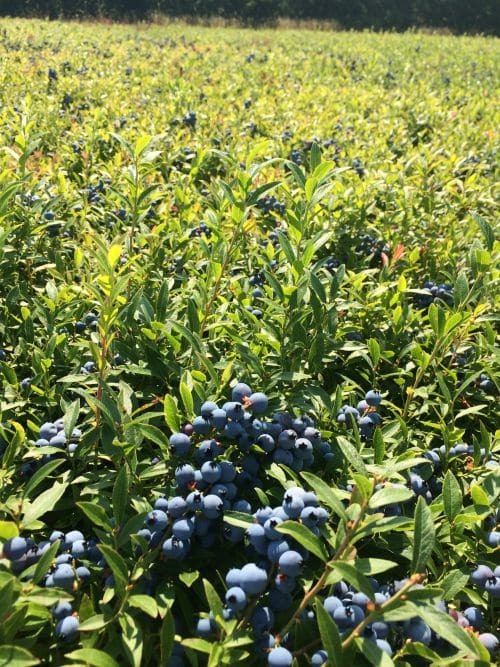 According to the Wild Blueberry Association of North America, historically, Wild Blueberry crops were harvested predominantly by Maine families, however today the industry relies on seasonal farmworkers, many of whom travel to Maine each summer. During the peak of the harvest season, Wild Blueberry growers may employ dozens of additional farmworkers (male and female) to harvest and quickly freeze the berries to ensure a high-quality product. The industry is grateful for their hard work and dedication, and depends on this important source of labor. Wild Blueberry growers follow detailed state and federal labor laws and compensation guidelines as they apply to seasonal and migrant workers. Maine farms are regularly inspected by the U.S. DOL and Maine Department of Labor staff. As mandated by federal law, and for safety reasons there are restrictions on the types of jobs minors under the age of 16 may do. Minors under the age of 14 are prohibited from working in Wild Blueberry fields unless they have written parental permission. I hope this helps provide some perspective on the labor force during the Wild Blueberry harvest. Thanks again for writing. I’ve actually done a little reading on this because I grew up in Maine, spending my childhood summers picking LOTS of blueberries (stopping by the side of the road whenever we saw a good patch), and only last year I learned that migrant workers are responsible for much of the harvest. 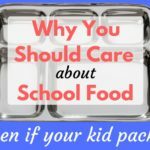 It just came as a surprise for me and I was intrigued to learn more. This article provides a bit of insight about the working conditions and pay (there is a big focus on undocumented immigrants, and I’m not trying to bring that topic into the conversation…but I think the parts that talk about the working conditions are really helpful so I wanted to share). In addition to immigrants from Latin America, there are some Native Americans who migrate within Maine for the harvest. “This was a world apart from the citrus groves of Florida or the vegetable fields of Georgia and the Carolinas, where working conditions have made shocking headlines since the late ’90s. Farmers in southern states have been prosecuted for modern-day slavery—holding migrant workers in debt and chaining them inside box trucks. There is also something called the Blueberry Harvest School, which provides some educational activities for the children of farm workers. Anyway, I am definitely with you on wanting to know more about where our food is coming from, and how people are treated. In terms of the price, I think it’s definitely worth it! And buying the frozen ones (I live outside of Maine now, so I was thrilled to discover them in my grocery store!) 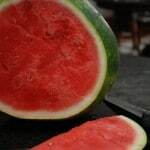 is about the same price as in-season fresh ones in Maine (unless you pick them yourself and they’re free). I made these this past weekend and my boyfriend DEVOURED them!! They were so good!!! 🙂 Thank you for sharing the recipe!